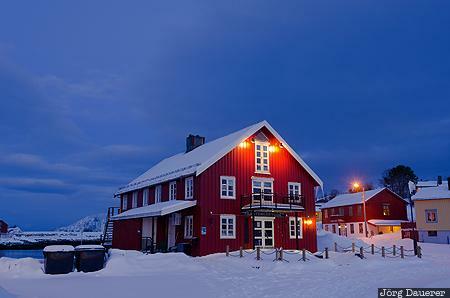 An illuminated red house surrounded by snow in the center of Kabelvåg at the blue hour just after sunset. Kabelvåg is in the south of the island Austvågøy which is part of the Lofoten archipelago north of the arctic circle in Nordland, Norway. This photo was taken in the evening of a cloudy day in March of 2013. This photo was taken with a digital camera.